Changing any corporate culture is a challenge, but I’ve found bringing diversity to the tech industry is even trickier. Fast-growth “unicorn” companies can quickly outgrow their founding venture-based startup corporate governance and find themselves facing crises with too few adults in the boardroom. Many reports assert women in technology industries still push against a silicon ceiling when it comes to career advancement and cultural issues. Research from the Society of Women Engineers found that 20% of today’s engineering school graduates are women, yet just 11% continue working in the field. Women in IT leadership roles (such as chief information officers or technology vice presidents) are just 9% of the total, according to a recent survey from Harvey Nash and KPMG. 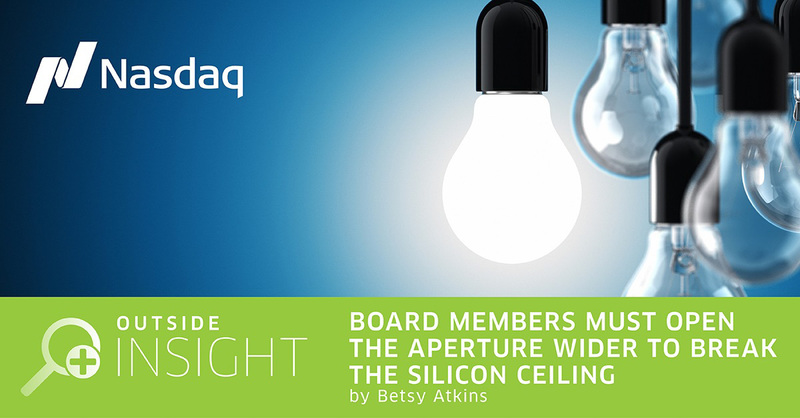 Today’s board members should open the aperture wider in terms of their role. The days of a board’s role being pure financial oversight was last millennium. This millennium, board members are expected to be an asset as well as an accelerant for the business. In my own experience, I’ve seen technology companies nurture diverse, inclusive cultures starting with a few one-on-one approaches from the boardroom. At Volvo Car AB, where I serve on the board, we’ve launched a program where I regularly meet with senior and mid-level women executives on personal career development. We work with these women execs to build on their strengths, clarify their career aspirations, and offer advice on advancement. This is a new program, but it is already proving a success in energizing and motivating the paths of these current and future female leaders. Group mentoring also harnesses networks and creates supportive environments where women managers and executives can brainstorm effective ways to promote diversity in the organization. According to a recent Harvard Business Review article about changing corporate culture, safe havens nurture cultural ecosystems that model what the organization can become in the future, while networks create coalitions that catalyze change. On the board of Schneider Electric, I make it a point to directly mentor one-on-one a number of women on the company’s senior leadership team. I teach them to advocate for themselves, identify executives within their company who they can network with, build rapport with as their mentors and nurture those relationships into sponsorships. Women in management may find it helpful to have someone in the boardroom take a personal interest in their career strategy and development. For example, at Uber, new board member Ariana Huffington is in an ideal position to put her mentoring and career savvy to work in helping rising women execs rebuild that company. One key to a successful mentoring program is a regular ongoing coaching and support. In my experience, a good mentor/mentee match also requires synergy: a strong personal chemistry and an alignment of professional disciplines. I’m a passionate advocate of digital transformation and customer-centric processes, so I tend to mentor women executives who have roles and expertise in line with those disciplines. Board members don’t have to wait for CEOs to ask for mentoring of female executives. When I spot high potential women managers within the companies of the boards I sit on, I approach our CEOs and offer to help these women reach the next level in their leadership potential. There is a big difference between mentoring—which is periodic advising and coaching—and sponsoring. Sponsors take a far more active role in helping individuals reach the next rungs in their careers. Women who are already senior managers or board members can kick mentoring up a notch by “sponsoring” women with high potential through career coaching, facilitating introductions to other executives and identifying and importantly, recommending them for new opportunities that will accelerate their careers. According to the Harvey Nash/KPMG survey mentioned above, only 28% of small-cap companies have a formal diversity initiative in place, versus 72% of large-cap companies. For newer, smaller tech companies that are in hyper-growth survival mode, it’s unlikely management will organically implement tactics that foster diversity of management. Hope is not a strategy. If a company really wants to drive cultural change, a prescriptive diversity goal could be considered. That goal can be defined based on the values of the company, and may include gender diversity, ethnic diversity, age diversity, global diversity, etc. Highly qualified female candidates ARE out there. I was the only woman on the board of HD Supply when I joined, and just three years later 23% of the board is female. I also sit on the board at Schneider Electric, where we set a goal of 40% gender parity on the board. Today Schneider Electric’s board is composed of 38% women, so we have nearly achieved that goal in just 7 years. The Volvo board I sit on has 23% women. These companies all operate in industries traditionally thought of as “male-dominated,” yet we were able to recruit highly quality female board members without compromising one wit the experience, talent and skillsets we were looking for. When I served as chair of the board’s compensation committee at tech firm Polycom, we were active in the annual recognition event for sales staff. I noted that women were leaders in sales, making up less than 10% of the sales force yet 34% of our “President’s Circle” top sales performers. Making an added effort to celebrate (and promote) this talent is crucial in sending the message that sales is not just a “guy thing” in the company. The talents of women are a strategic asset to companies, and there is a growing body of research proving that firms who nurture and empower their gender diversity gain in revenues and stock performance. In any company, balance sheet results are always found downstream from company culture. When it comes to reshaping that culture to be welcoming to women, the boardroom is the ideal place to start. Betsy Atkins serves as President and Chief Executive Officer at Baja Corp, a venture capital firm and is currently the Lead Director and Governance Chair at HD Supply. She is also on the board of directors of Schneider Electric, Cognizant and Volvo Car Corporation and served on the board of directors at Nasdaq LLC and at Clear Standards as CEO and Chairman.